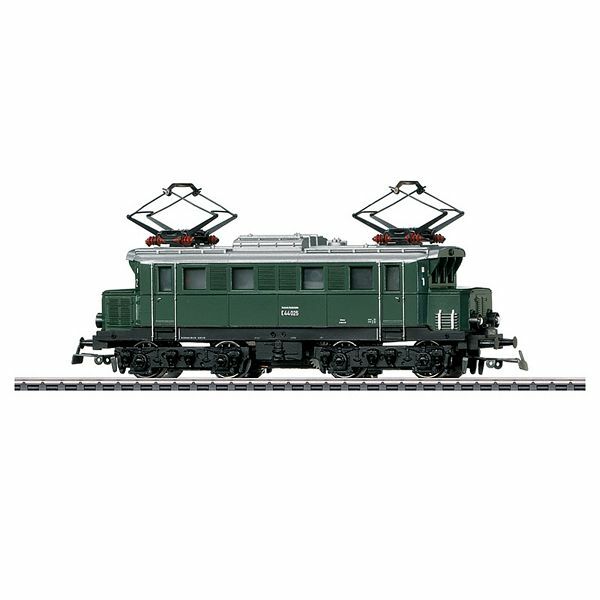 Prototype: German Federal Railroad (DB) class E 44 electric locomotive. “Bottle Green” basic paint scheme. Double-arm pantographs included. Road number E 44 025. The locomotive looks as it did around 1960. Model: This is a reissue of a Märklin classic. It has an mfx digital decoder. The locomotive has controlled high-efficiency propulsion. 2 axles powered. Traction tires. The dual headlights change over with the direc - tion of travel, will work in conventional operation, and can be controlled digitally. The third headlight under the roof is merely indicated. The loco - motive body and frame are constructed of metal. There are coupler hooks at both ends of the locomotive. The packaging is based on the Primex packaging at the beginning of the Seventies. Length over the buffers 16.5 cm / 6-1/2“. One-time series for the anniversary “50 Years of Primex 1969-2019”.